Luton boxer Frankie Storey recorded an impressive win over Spanish featherweight champion Edu Torres at Lewisham Theatre recently. 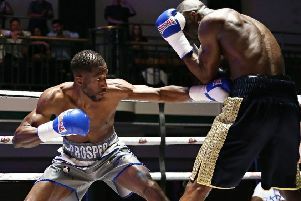 Storey, who fights for Finchley and District, overpowered the Spaniard during the three round contest and was hugely enthused by his performance ahead of a trip to Mexico City on March 27. 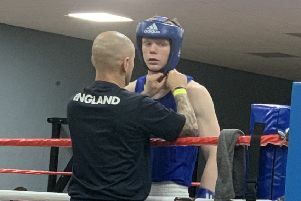 Talking through the encounter, Luton’s 57kg southpaw emphasised the importance of momentum when going into the International Box Cup. He said: “He was a counter-puncher, so from the first bell I was on the front foot as it was two southpaws trying to work each other out. “I had to make the first move and I dominated the rounds. “I boxed superbly in the final round and had him down with five seconds to go but the referee let him away, I’m guessing as the fight was nearly over. “I feel like I needed a fight, as there has been a lot of hype about the Box Cup in Mexico. “It’s quite a prestigious show, and the WBC amateur organisation is expanding week by week with lots of new opponents out there.